LUKE Breust, Isaac Smith and Paul Puopolo all took the long route to start their AFL journeys. But, their extended waits were well worth it. 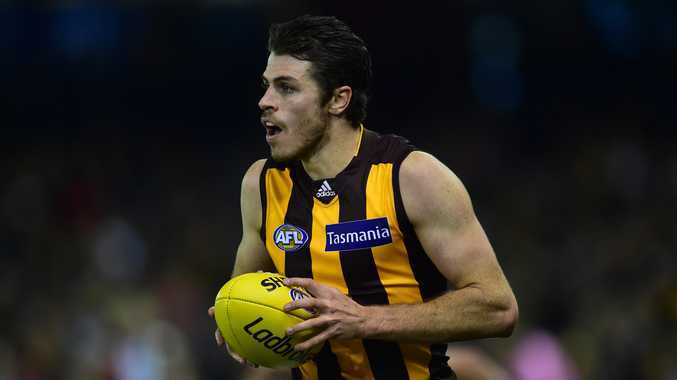 New South Welshmen Breust and Smith, at 20 and 22, respectively, and South Australian Puopolo, at 23, were hardly spring chickens when they debuted for Hawthorn. One-time Sydney reserves player Breust had spent two years on the rookie list, late-bloomer Smith had been kicking around in country footy, while small man Puopolo was never considered capable of stepping up from the SANFL. But, all three, who made their first appearances in the seniors in 2011, have enjoyed a run of success few others in the game have experienced. In fact, Breust and Smith can, for now, lay claim to having the best winning strike-rate of any VFL-AFL footballer to have played 100 games. After Hawthorn's 89-point thrashing of Sydney on Saturday night, they both surpassed the mark of Clyde Laidlaw (81.05%), who played 124 games and was a part of Melbourne's golden run in the late-1950s and early 60s. The Demons won three consecutive premierships between 1955-57 and then three more in 1959, 1960 and 1964. The Hawks aren't quite up to that standard just yet, but they are building an enviable record that stacks up with some of the best. Since the start of the 2011 season - a year in which they were overrun in the last quarter of their preliminary final against Collingwood (going down by three points) - the Hawks have lost just 24 of their 115 games. They're also slightly below Geelong's record of 105 wins from 125 games between 2007 and 2011, but are on track to surpass the Cats with a rare 'threepeat', which has only been achieved five times: Brisbane (2001-03), the aforementioned Melbourne twice (1955-57) and (1939-41), Collingwood (1929-31)and Carlton (1906-08). A lot of water has to go under the bridge until that 'first Saturday in October', but if the performances of their two biggest threats, Fremantle and Sydney, in the past two weeks are anything to go by, it is the Hawks' flag to lose. They have beaten both rivals by a combined 161 points, while inflicting the biggest coaching defeats on Ross Lyon and John Longmire in the process. They had fewer disposals (381-398) and fewer clearances (36-38) than the Swans and only one extra forward-50m entry (51-50), but their pressure forward and back was immense, and their efficiency coming out of defence and heading into attack was immaculate. Deficiencies, meanwhile, have been shown up right across the ground for both the ladder-leading Dockers and the now fourth-placed Swans. Neither is able to conjure the spread of goalkickers, nor the defensive mechanisms the Hawks can. Fortunately for both Lyon and Longmire they have time to go back to the drawing board and try plot ways to stop this Hawthorn juggernaut.